Dan and I are back in Portland this week, visiting friends, Moses and Sonya and we're loving every minute of it. Being in this awesome foodie town last year as well, I always look forward to exploring new culinary delights and returning to old favorites. 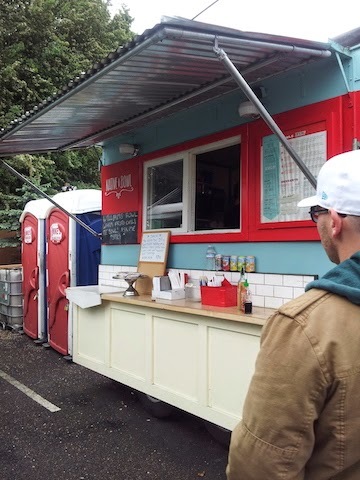 Our first foodie encounter was of the latter, as we headed to a small food truck spot in the North East neighborhood of Portland on North Mississippi Avenue. 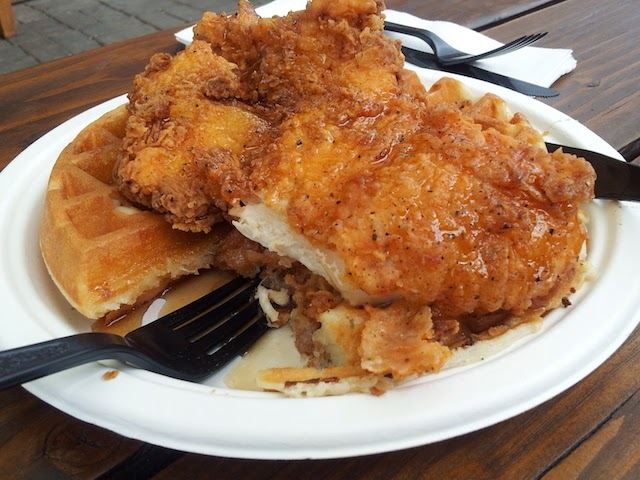 Dan was after one thing and one thing only, which was Miss Kate's Southern Kitchen Truck's fried chicken and waffles. I on the other hand wanted to try something new and went with a Native Bowl vegan creation, which satisfied my hunger and nurtured my soul. Miss Kate's Southern Kitchen Truck - Paying homage to talented female cooks everywhere, Miss Kate's serves up classic Southern dishes with a Portlandian twist. I love that it serves up comfort food with fresh, local ingredients such as arugula, purple onions, local cheese and the like. Dan and I have tried it last summer as well and fell in love with their chicken and waffles as well as the chicken and biscuits. The former made a huge imprint on our tastebuds, and Dan ordered it not long after we got to the truck. I'm happy to report that it was as delicious as we remember it, if not more. The waffle was buttery and moist and slathered with sweet maple syrup. But the piece-de-resistance was the fried chicken, which was seasoned beautifully and tasted like high quality, juicy chicken that's on the bone, but surprisingly actually boneless. While the whole thing went down easily, it was really filling and definitely conducive to sharing with a dining companion. Native Bowl - I love the motto of Native Bowl, which stands for healthy, fresh vegetarian food made with love. Headed up by Julie and Jay Hasson, they're no strangers to the Portland food scene, as they're often featured in local food media from digital publications to television. Immediately attracted by their cheery, red truck, I appreciated their simple menu of bowls, which all contain some form of tofu. After chatting up one of their employees, I inquired about the Couch Bowl (pronounced "cooch"), which was rumored to be very spicy. 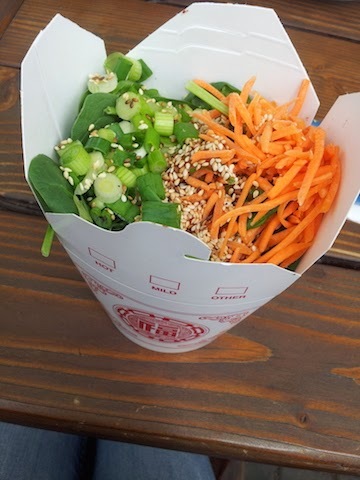 Despite some reservations, I went for it and loved every bite, including layers of garlic tofu, spinach, carrots, scallions and toasted sesame seeds. All the ingredients were then enveloped by the spicy/sweet gochujang sauce, which rocked my world. Even though it had quite a kick, the spice dissipated quickly and kept you reaching for more. Dan tried it too and loved the flavor profile. After ordering these yummies, we popped a squat at Prost! beer garden for a pint of lager. Loving the convenience of it all, we noticed other patrons that had the same idea and enjoyed the diversity of the street food with high quality European-style beer. Prost to all that and to more good eating in Portland!